Paneer, Indian cheese, is one of those wonderful ingredients that once you discover you wonder how you ever lived without. Making it from scratch is comparable to opening a massive box of shoes only to find flip flops inside it. Sorry boys – think big garage little skoda. I’d rather focus my limited energy on making the dish. Besides paneer is readily available in Indian food shops and larger supermarkets. This Paneer Matar recipe is tradional Punjabi fare. It’s so simple and effective. A real staple and great choice for a Diwali meal. Heat two tablespoons of oil in a large frying pan and saute the paneer pieces on either side on a medium heat until golden in colour in two opposite sides. Remove from the oil with a slotted spoon and set aside. Finely chop the onions, and grate the ginger and garlic. Add the third tablespoon of oil to the pan the paneer was fried in. Heat the oil on high and fry the onion for 10 minutes stirring regularly until pale golden. Then add the ginger and garlic and saute for another five minutes until a deeper shade of brown. Add the coriander, cumin, turmeric and chilli powders along with a few tablespoons of warm water. Cook this mixxture for five minutes, until the masalas lose their pungent smell. If the mixture starts sticking to the bottom of the pan, add a little water. Then add the chopped tomatoes and keep frying. When the tomatoes disintegrate, lower the flame and let the mixture simmer. When the mixture in the pan starts oozing oil from the sides and through little holes, turn the heat up, add the peas and half a cup of water. 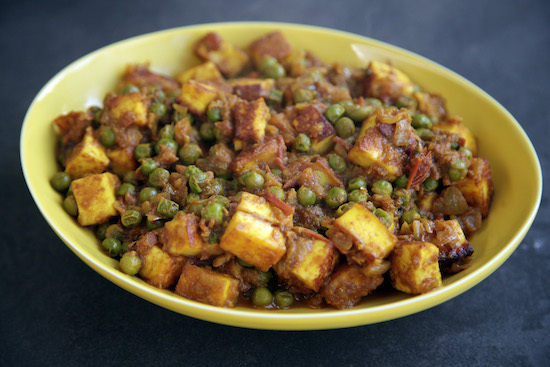 Drop in the paneer cubes, cover and simmer for 10 minutes, stirring from time to time. When the oil from the masala and peas mixture floats to the top, add salt to your taste and the kasoori methi and water if using. Simmer for five minutes. You can add water if you want a curry or serve this as a moist sabzi. Enjoy this Paneer Matar recipe scooped into a roti. You have a lovely blog here, found myself browsing through all your archives. Read your ‘About Me’ section as well and found myself smiling – reminded me of ME!! The world now knows your nickname. I am so happy to see this great interest awakening in you-a family trait. Great recepies and I will definately get back to this and contribute our Bengali recipie of Chanar Dalna or Paneer bengali Style. Mangs, don’t let a blender in a recipe put you off. When I blend onion, garlic and ginger I do it because I’m a lazy cow that can’t be bothered to chop. I have used a blender for this Punjabi style chanar dalna, but just chop up the said ingredients and the results will be very similar. So happy to hear the dhal and begun came out okay. also, stalker again, you add water at the peas stage and then again really soon after?? The water only goes in with the peas, no more water needed. This dish should have a thick gravy. Good luck! let me know how it goes, okay? it was yummmmy. fed me for two and a half days plus one curious american, one skeptical slovenian and one satisfied syrian christian. thanks!! the “here’s what to look out for” bits are esp helpful (masalas bubble to top etc). What is Â½ supposed to be? Or is it just half a teaspoon?